Have I ever told you about my Jamie Oliver obsession?? It started a few years back when I first launched my blog and was getting really into food photography. My mother-in-law loaned me one of his older cookbooks (which I still have :) Thanks, Angela!!) and I LOVED it. I now have about 5 of his cookbooks which is really only a small number of his total cookbook collection. After visiting England for the first time with Stephen’s family, I discovered that Jamie Oliver also has his own magazine, Jamie Magazine, which is easily my favorite culinary magazine of all time! I’ve been introduced to so many new things through his recipes and I really love that. 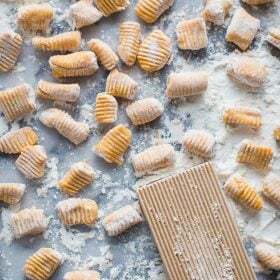 And while many of his recipes are a bit adventurous for me, they’re still pretty easy and very doable. The VERY unfortunate part of all this is that you can’t get Jamie Magazine in the US. I mean, you can order directly from them with international shipping but it’s something like $150 a year and that just seems ridiculous. And LUCKILY for me, my wonderful mother-in-law visits England often enough to bring me back a good chunk of the magazines throughout the year. My ultimate dream is that they’ll start some sort of Jamie Magazine USA with a hub in Nashville and hire me to be one of their staff writers/ food photographers. I do realize that this is very far fetched but a girl can dream! SO, today’s recipe is one that I borrowed and just slightly adapted from last month’s edition of Jamie Magazine. I wanted to try something a bit different with some new flavors and new spices that I don’t typically use. The original recipe called for Ras El Hanout which I had never even heard of and definitely couldn’t find at ANY of the stores here in Nashville. After a bit of research, I learned that it’s a Moroccan spice blend with about 15 different spices in it. Naturally, I was able to find it on Amazon but I decided to try mixing the spices on my own since I had most of what is in ras el hanout. So, in case you were curious, that’s why this recipe has SO many spices in it. Trust me, it’s TOTALLY worth it!! I’m maybe a little in love with the flavors of this dish. SO so good. Bonus: this recipes is SUPER easy to throw together. The only pre work it requires is chopping the squash and cilantro and then quickly mixing together the spices. Everything else is pretty much just dumping ingredients onto the pan. 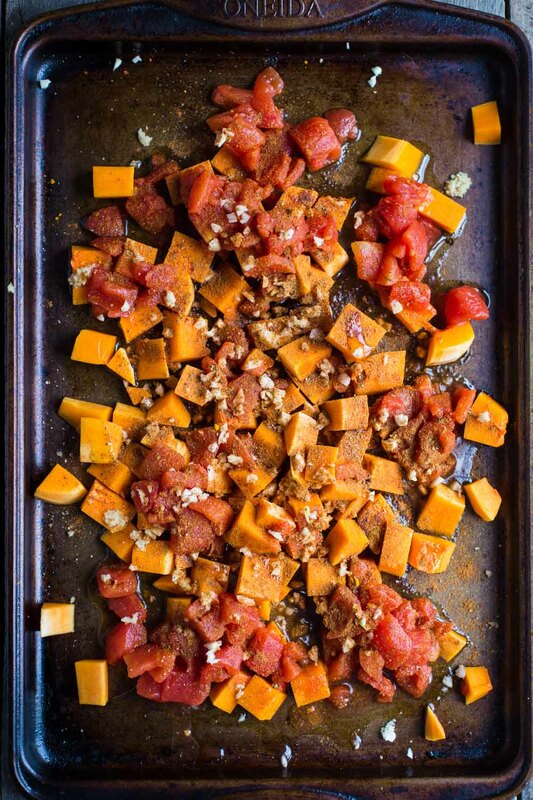 First we toss the squash, tomatoes, garlic, oil, and half of the spices together and roast them for about 20 minutes. Then we mix in the chickpeas and spinach. And then the salmon is gently placed on top of it all and sprinkled with the remaining spices. While that’s back in the oven, the couscous is cooked. 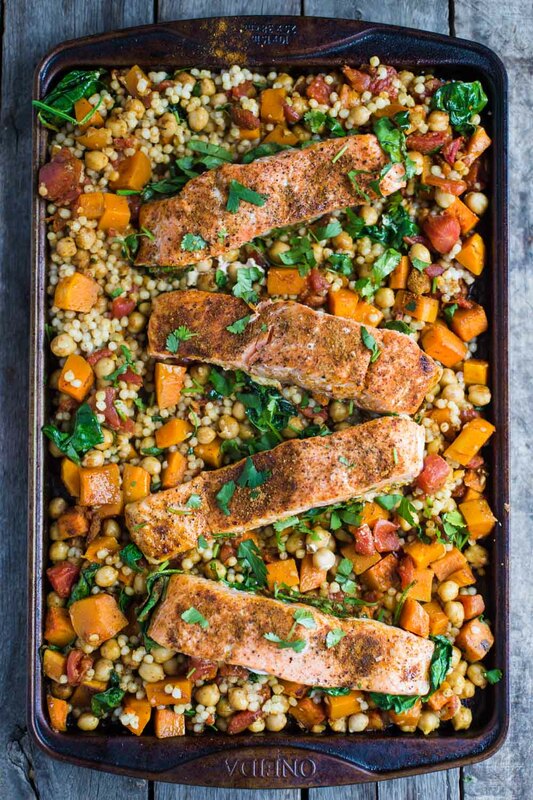 Now, this dish would still be amazing without the coucous (and maybe a bit healthier/ lighter) but I suggest that you DON’T skip the couscous. 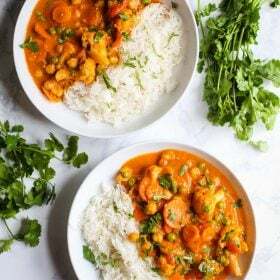 It adds another level of flavor and texture that just works SO well with the dish. 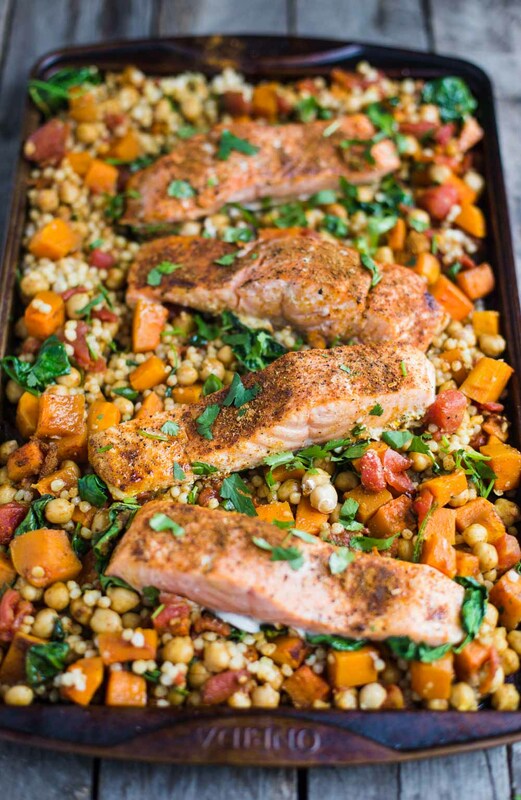 Once out of the oven, simply remove the salmon and stir the couscous into the squash mixture. Evenly distribute everything onto 4 plates and ENJOY! 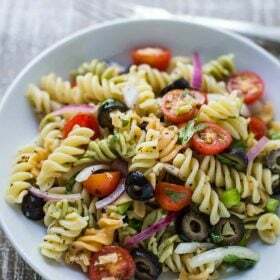 This dish is definitely going into the regular rotation in our house! And the makeshift ras el hanout that I made was a TRUE winner. Love those spices mixed together!! In a small bowl, combine all of the spices (from the sea salt to the cayenne). Set aside. On a large greased baking tray, spread out the squash and toss with the oil. Stir in the tomatoes, garlic, and stock and sprinkle with half of the seasoning and then toss to coat. Bake for 20 minutes. 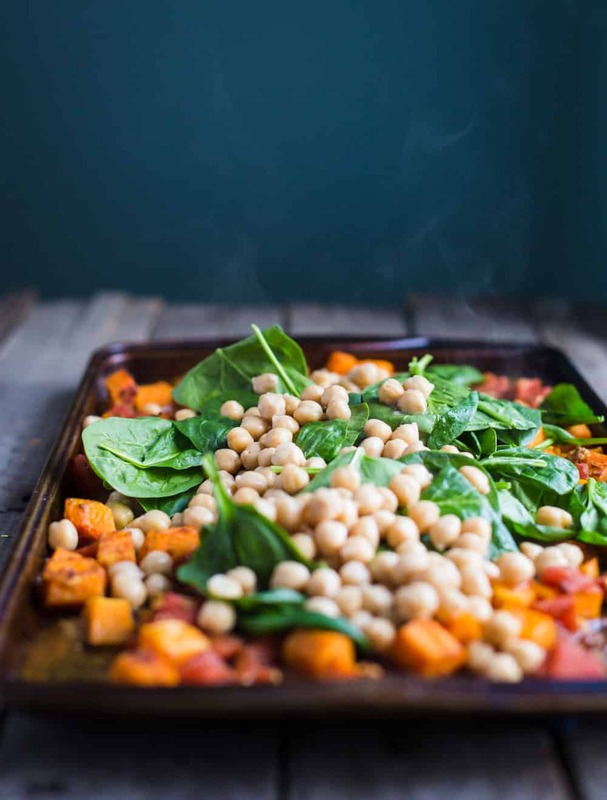 Remove from the oven and stir in the chickpeas and spinach. 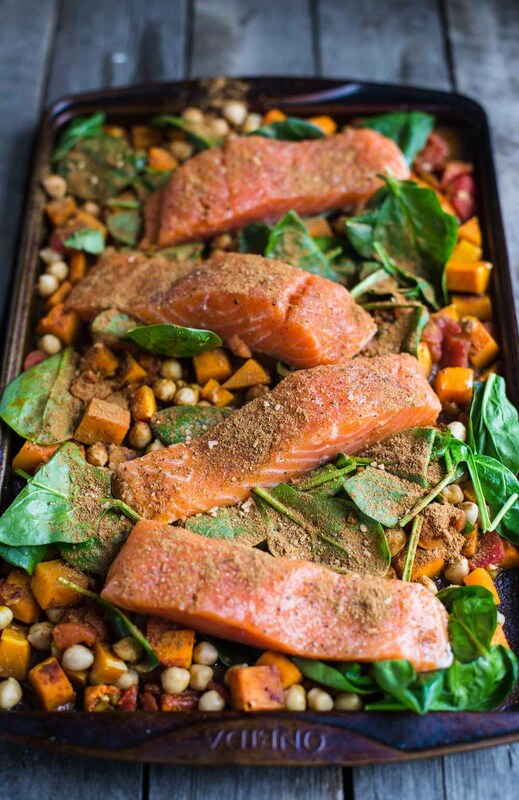 Place the salmon on top of the squash and chickpea mixture and sprinkle the remaining spices over top of the tray. Place back in the oven for 12-15 minutes or until the salmon is cooked through. 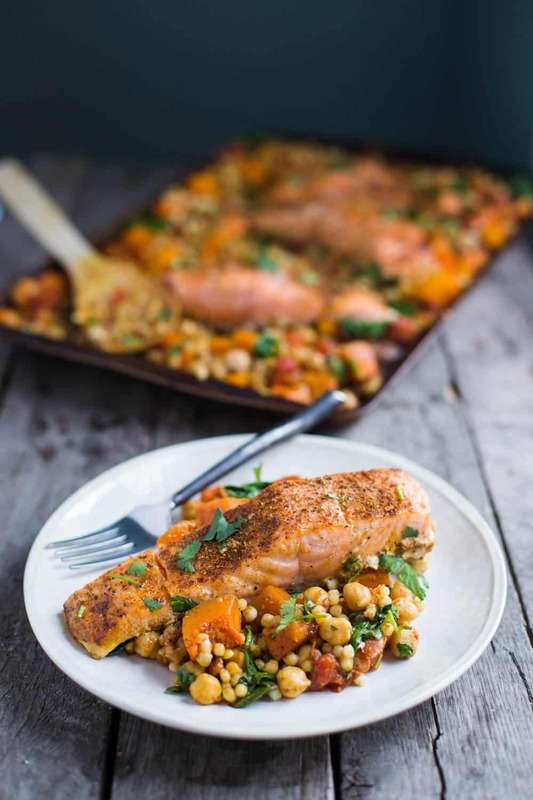 While the salmon bakes, cook the couscous according the packing directions. Drain and set aside. Once done, take the salmon tray out of the oven. 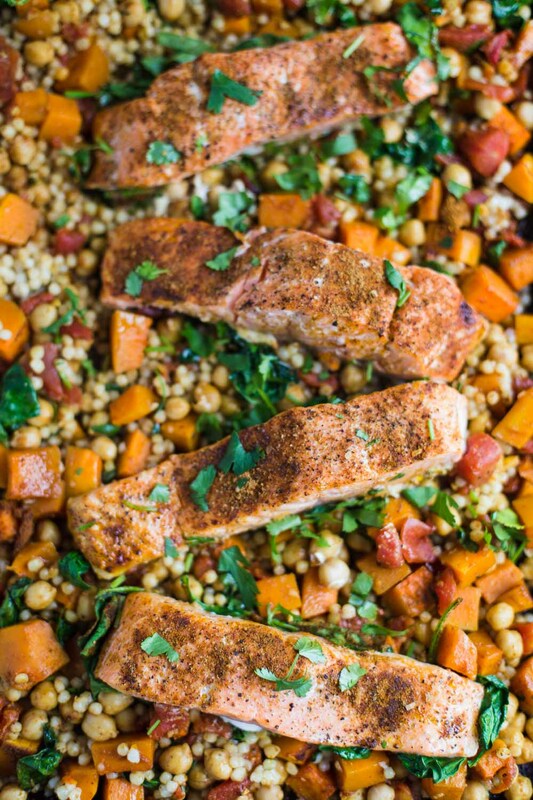 Place the salmon fillets on a separate plate and mix the couscous and cilantro into the squash and chickpea mixture. Spread the mixture evenly among four plates and top with the salmon plus a bit more fresh cilantro if desired. 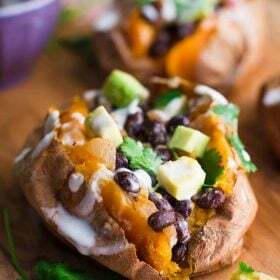 This looks incredible – healthy, flavorful, and unusual! Thanks for doing the grunt work to figure out the spice blend. YUM. hah! It felt weird to put THAT many spices into one dish but it was SO yummy!! I’ve been eating a lot more fish recently.I’ll certainly be keeping this flavor combo in mind! It’s SUCH a great flavor combo. I’ve been craving it all week! WOAH! This looks UH-mazing Brita! I love dishes with loads and loads of spices. This for sure is a keeper! This looks amazing! I’m sure if you post this link to jamies facebook and Twitter he’ll consider your magazine idea. I used to have a friend that knew him but we fell out sorry! But I hear he’s ultra approachable! I love his recipes too especially 30 minute meals. Good luck! haha! I’ll have to tweet this at him. I think he would love Nashville! 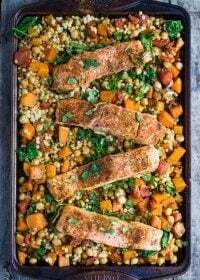 I make salmon almost every monday and I can’t wait to try this recipe! I love all of those spices, yum! 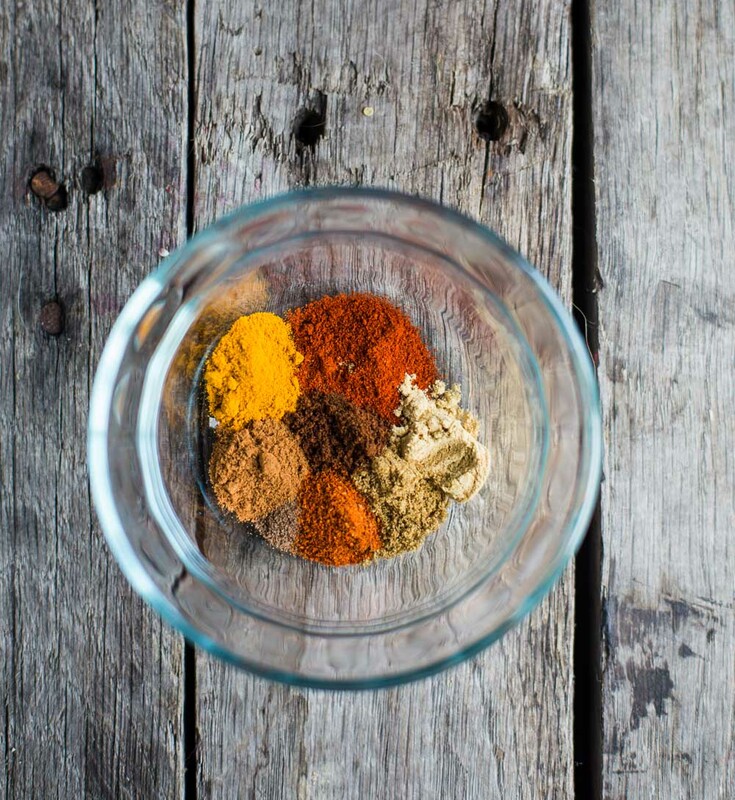 I actually have ras el hanout – do you know what the measurement would be to use that instead of your combination? 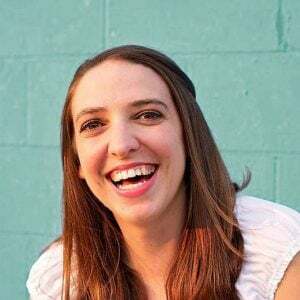 Hi Jill! You would want 3 tablespoons of the ras el hanout. 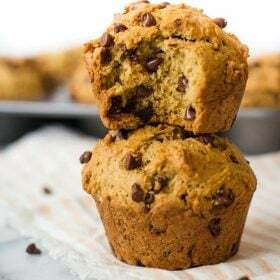 Hope you like the recipe! Hi and Thank you!!! Just confirming 3 tablespoons vs teaspoons? And the ras el hanout would replace everything from the paprika down through the cayenne? Can’t wait to try this! Help, I’ve been informed and I can’t become igonrant. 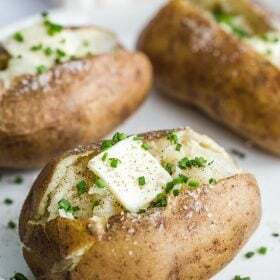 Great one pan recipe! I just wanted to let you know I have seen Jamie magazine here (in NYC) at Barnes and Noble. 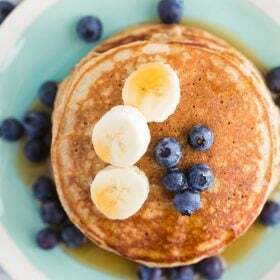 My trainer at Well&Tight introduced me to this recipe and its my go-to for company! Love love love it! Aww yay! isn’t it such a good recipe?? It’s one that I make fairly regularly! 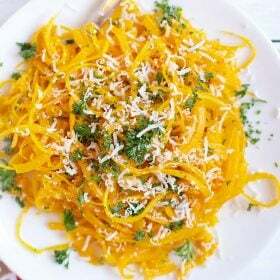 Do you think that I could substitute the butternut squash with sweet potato? This meal was absolutely delicious! Plus light and easy (my favorite)!